An island, or rather a group of islands, off the coast of Istria in north-western Croatia, that is now a National Park, but in the Yugoslav era served as Tito's personal summer residence and resort, a place where he would receive countless world leaders and celebrities. As such it has a strong Yugoslav aura persisting to this day. And in a special “Tito on Brijuni” exhibition this is especially celebrated. It's a unique place in the cult-of-personality category of dark tourism. The place is also known under its Italian name Brioni. I use both spellings interchangeably here. More background info: Brioni's history goes back as far as that of nearby Pula – i.e. to even before the Ancient Roman Empire. Later the islands were owned by the Venetians from the Middle Ages, and in the early 19th century even Napoleon briefly annexed them. But from 1815 Brioni became part of the Austrian Habsburg Empire. As the Austro-Hungarian military constructed a major naval base at Pula, they also built a significant fortress on Brioni, “Fort Tegetthoff”. Some of the old fortifications are still visible today. In the late 19th century the archipelago was purchased by the Austrian business tycoon Paul Kupelwieser. As the island was infested with malaria-carrying mosquitoes, Kupelwieser invited the German Nobel Prize laureate and pioneer in modern bacteriology Robert Koch, who had isolated the agents that cause tuberculosis, cholera and other diseases (cf. Charité and Beelitz), to conduct research into the causes of malaria between 1900 and 1902. After malaria had been eradicated from the island, its career as a holiday resort began. Kupelwieser had new hotel and spa facilities built, and soon the islands began attracting a high-level clientèle of guests from elites around Europe. One famous guest was the Irish writer James Joyce who was here for his 23rd birthday in 1905. Another notable guest was Austrian Archduke Franz Ferdinand – whose assassination in 1914 in Sarajevo triggered the outbreak of WW1. WW1 also brought an end to Brioni's tourism prosperity for a while, but in the inter-war years it was partially restored, when Istria was under the administration of Italy, but Brioni remained privately owned by the son of Paul Kupelwieser, Karl. After his suicide in 1930, however, the business declined and in 1936 the islands fell into Italian possession after all. With the outbreak of WWII the islands again became militarized, with more fortifications and artillery being added. As such the islands also became the target of aerial attacks, especially in a bombing raid in late April 1945 that destroyed much of the former resort infrastructure. Following WWII and the creation of the Yugoslav Socialist Federation, its leader Josip Broz Tito took over the archipelago and made Brioni his personal summer residence and resort. In addition to his own residence he also had guest house and meeting facilities constructed and between 1954 and 1979 he received numerous world leaders from around 60 countries. It was also here that in 1956 he met with Abdel Nasser of Egypt and Jawaharlal Nehru of India for talks that laid the foundation stone for the creation of the Non-Aligned Movement. Other top-notch guests included Queen Elizabeth II of Britain, Leonid Brezhnev of the USSR, Colonel Gaddafi of Libya, Walter Ulbricht of the GDR, but also Willy Brandt of West Germany (FRG). Non-political celebrity guests of Tito's on Brioni included actress Sophia Loren as well as Liz Taylor and Richard Burton (Burton portrayed Tito in the 1973 Yugoslav-produced movie “The Battle of Sutjeska” about the Yugoslav partisan war!). Brioni also became home to numerous exotic animals that Tito was presented with as gifts by some of his high-ranking guests, including elephants, antelopes, camels and even leopards. For these, a safari park was created in 1978. After Tito's death in 1980, the whole Brioni archipelago was turned into a National Park in 1983. A year later a museum/photo exhibition about Tito and his special relationship with Brioni was opened (see below). In 1991 Brioni was briefly again a place for political meetings between delegations of the newly forming factions in the break-up of Yugoslavia. However, the islands were spared any destruction or violence during the Yugoslav Wars. By the 2000s much of the infrastructure on Brioni had fallen into decline, but since then refurbishing projects have brought the National Park back to life as a popular tourist attraction. What there is to see: The main reason for a dark tourist to come to Brioni is of course the Tito connection. There's just something special about visiting his once private island and staying in what used to be his guest houses where he entertained so many world leaders and celebrities. What used to be Tito's private mansion, Bijeli Vila ('white villa') is off limits to tourists, but the Hotel Neptun makes for a good stand-in. The place oozes a nostalgic, slightly stuffy, retro atmosphere. In terms of decoration, time seems to have been standing still here since ca. 1979 (when Tito was last on Brioni). But the main thing to go and see when on Brioni is the Photo Exhibition “J.B. Tito on Brioni”. 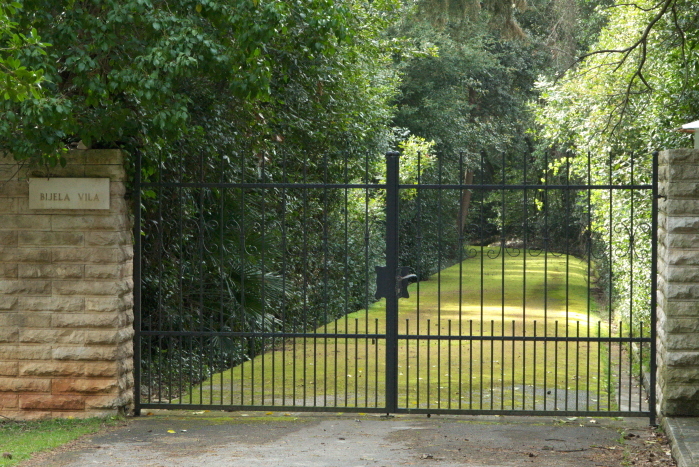 As you approach the building, which is behind the Hotel Karmen to the north-west of the bay with the boat pier, you come to a single open-air exhibit: Tito's 1953 Cadillac Eldorado, that he used exclusively on Brioni, including for chauffeuring his high-level guests around the island with himself behind the wheel. The car was restored in 2007 and and is now protected by a perspex “cage”. Some panels provide a little information (in Croatian and English) and there's an old photo showing Tito behind the wheel of this very vehicle. 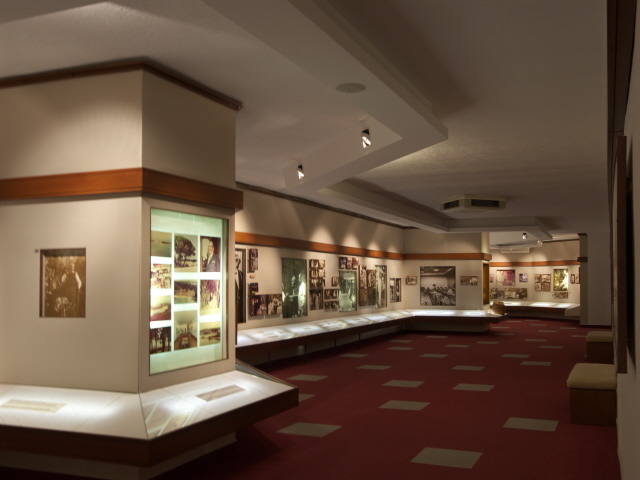 The villa to the west of the car exhibit actually has two exhibitions. In addition to the Tito-themed photo collection, there's a so-called “natural history exhibition” on the ground floor. This consists of a collection of stuffed animals, some of which were gifts to Tito, including some there were given to him alive, but were later stuffed after their demise. Also on the ground floor is a plaque that celebrates the 1956 meeting of Tito with Nehru and Nasser that led to the Brioni Declaration on 19 July 1956 with which the Non-Aligned Movement was effectively founded (see above). On the wall opposite is a blow-up of a black-and-white photo of Tito releasing a white dove ... Tito the bringer of peace! A stuffed white dove suspended by wires from the ceiling seems to be flying back towards Tito … Tito the receiver of peace? The photo exhibition is upstairs, and to get there you first have to go back outside and find the stairs to the right of the main entrance. At the top of the stairs is an anteroom that is a veritable Tito shrine. 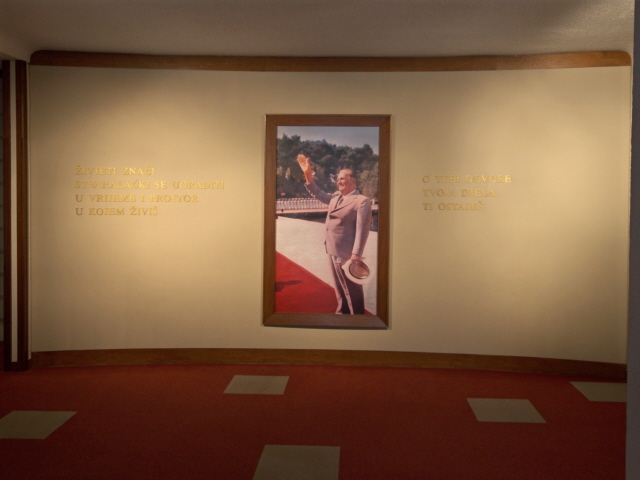 On a curved wall is a large picture of Tito waving benignly from a red carpet. The picture is flanked by inscriptions in golden letters (all in Croatian, so I don't know what it says). Of particular interest is the second section of the exhibition with all the photos that show him with a wide range of world leaders and celebrity guests: Tito with Liz Taylor, Tito with Sophia Loren, Tito with the Queen, and then of course all those politicians: Tito with Haile Selassie (Ethiopia), Tito with Khrushchev (USSR), with Ho Chi Minh (Vietnam), with Indira Gandhi (India), with Walter Ulbricht (GDR), with Gaddafi (Libya), with PLO leader Arafat, with Hafez al-Assad (Syria), with Fidel Castro (Cuba) … and so forth. Especially noteworthy I found the photos of Tito with Brezhnev and Willy Brandt – in the former both Tito and Brezhnev look quite the worse for wear after obviously copious amounts of wine – and in the latter a broadly grinning Willy Brandt (FRG) is giving Tito a light (a cigarillo), cocktails can be seen on the table … Tito certainly knew how to entertain his guests and they clearly enjoyed being entertained, with good food and plenty of alcohol clearly playing a key role. In a side room there's also an additional exhibition entitled “Memories of an old Austrian” – this is about Paul Kupelwieser (see above) and the mark he left on Brioni. Back outside, note also the Tito bust in front of the entrance. The rest of Brioni is less specifically of any dark interest, but of course once you're there you could just as well have a look around. We hired one of those electric golf carts for an hour and went for a spin round the island, in particular to the north-western end with the safari park. But I did not have the time to visit the pre-WW1 Fort Tegetthoff (see above), the dinosaur footprints or any of the Roman relics or other cultural or natural attractions. With one exception: I popped into the St German church. In there, in addition to the frescoes and relics of Glagolitic script (an ancient Slavic alphabet) there was a fine example of a Mediaeval “Danse Macabre” (or 'Dance of Death'). So there was finally another dark element. Location: a bit under 2 miles (3 km) off the western coast of Istria, Croatia, and ca. 5 miles (8 km) north-west of Pula. Access and costs: by boat only (but there are frequent connections in season); prices vary. To get to Fažana it's easiest to drive; you can park at the large car park north of the pier, or if you've booked a hotel room on Brioni they have their own secure-parking garage (get directions/instructions from them). For getting around on the island, beyond what you can do on foot, there's a place behind the Istra-Neptun Hotel where you can rent bicycles or electric golf carts (ID required). If you want to stay overnight (or longer) on Brioni there are several accommodation options, at least in season, with two hotels and a few villas (for groups/families). In low season, also when I went (early April 2018), only the Hotel Neptun is open – but that's the most interesting pick anyway. Prices are a bit higher than what you pay on average on the mainland, but I'd say it's worth it for the unique retro atmosphere. As for food & drink, there's a self-service outlet opposite the Church of St. German not far from the hotels. 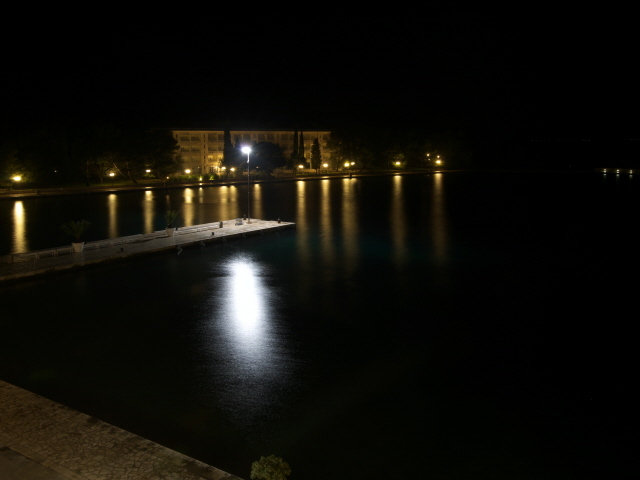 The Hotel Istra-Neptun has an a la carte restaurant (only open in season) and a buffet/set-meal restaurant for guests in the Neptun, which also has a bar and terrace café. The museum exhibitions are open during normal daylight hours and are free of charge. Time required: for just the dark aspects, i.e. in particular the Tito museum, just a couple of hours would actually do, i.e. a day return trip. But to get the full retro atmosphere I recommend staying a night in the former guest-house-turned-hotel. Those who also want to make use of all the recreational facilities and non-dark-themed exhibitions can probably spend several days here. Combinations with other dark destinations: The neighbouring, second-largest island of the archipelago, Mali Brijun ('little Brioni'), has some relics of massive fortifications (see above), and on the south-western peninsula even some big rusty gun emplacements still in situ. But when I was on Brioni in the low season, no boat excursions to this island were on offer, so I wasn't able to see these for myself. The closest other place covered separately in its own chapter on this website is Pula. But see also under Croatia in general. Combinations with non-dark destinations: Most of Brioni is a non-dark tourist attraction, both in terms of nature and cultural heritage, what with some prehistoric dinosaur footprints and all the ancient Roman and other relics to be found here, and also simply for recreation (e.g. golf, snorkelling, hiking, etc.). See the National Park's own website (np-brijuni.hr). In season a wide range of activities and sightseeing tours are on offer on the island. For things further afield see under Croatia in general.